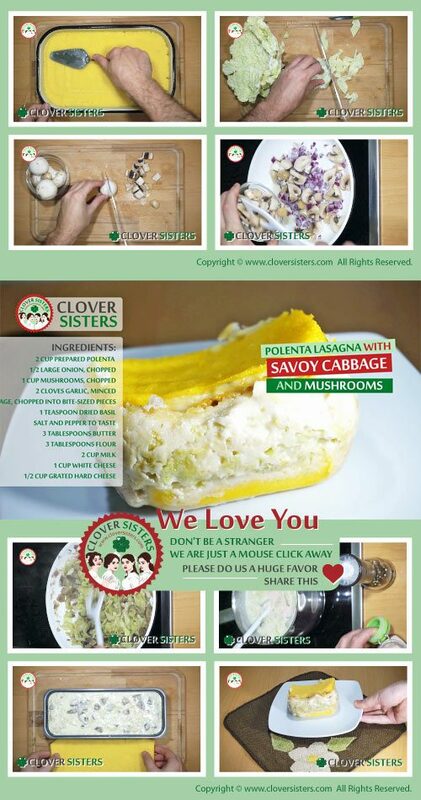 Healthy and economic, polenta lasagna combined with freshness of savoy cabbage and rich texture of mushrooms and that beautiful béchamel smoothness is smart choice and fun making at the same time. Cook the polenta as instructed on package to get about 4 cups. Pour it in two trays of the same sizes, one of them will be used in oven. Let it thick and cool while preparing the filling. Heat the butter, add the flour and stir few minutes, then add the milk and bring slowly to boil. Remove from the heat and add the white cheese and grated hard cheese, stirring the whole time. Onions, mushrooms and garlic cook in a non-stick pan for about 5 minutes. Add the savoy cabbage and some water. Sauté until the savoy cabbage is tender and the water has evaporated. Combine with the cheese béchamel. Season to taste. 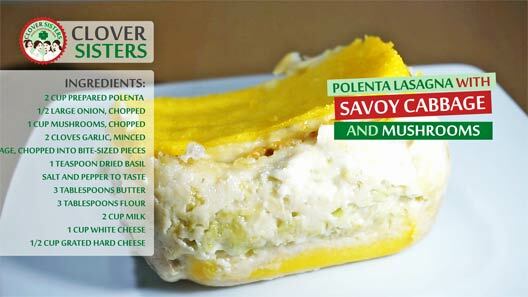 Place creamy mixture over the one layer of polenta and top with the other. Bake in oven preheated to 400F (200C).